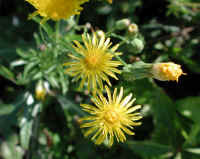 (Sow-Thistle, Common (Sonchus oleraceus) - 01) We believe that this wild flower is a common sow-thistle because of its smooth stem, unlike the hairy stem of the field sow-thistle, and its base leaves are pointed, unlike the rounded lobed leaves of the spiny-leaved sow-thistle. 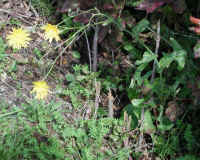 (Sow-Thistle, Common (Sonchus oleraceus) - 01a) In this photo we can see the prickly leaves with their pointed lobes, and that the stems are smooth. (Sow-Thistle, Common (Sonchus oleraceus) - 02) This is a bird's eye view of the common sow-thistle with its flowers and buds. 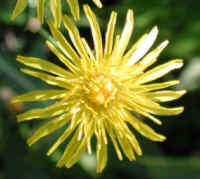 It has been generally classified as a member of the Aster or Asteraceae family, formally the Composite family. (Sow-Thistle, Common (Sonchus oleraceus) - 02a) This is a bee's eye view of the one inch diameter flower of the common sow-thistle, which is not yet fully opened. (Sow-Thistle, Common (Sonchus oleraceus) - 02b) This is a close up view of a fully developed common sow-thistle bud, which is just about ready to open, and a six-legged visitor who came to witness the occasion. (Sow-Thistle, Common (Sonchus oleraceus) - 03) This small cluster of common sow-thistle shows both the flowers and the feathery seeds ready to take flight to propagate the species. 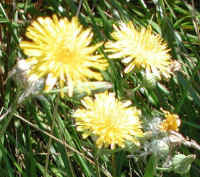 (Sow-Thistle, Common (Sonchus oleraceus) - 03a) These are three fully opened common sow-thistle blooms that are glistening in the sunlight. 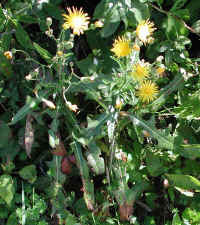 (Sow-Thistle, Common (Sonchus oleraceus) - 03b) This is a closer look at the common sow-thistle that has gone to seed. 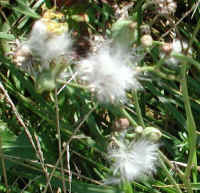 (Sow-Thistle, Common (Sonchus oleraceus) - 04) This is an even closer look at one of the common sow-thistle's seed clusters that is preparing to become airborne in the next gust of wind. 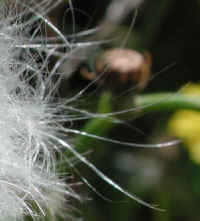 (Sow-Thistle, Common (Sonchus oleraceus) - 04a) This is a magnified look at one of the common sow-thistle seeds, with its feathery ends extended to catch the next breeze to carry it through the air and away from the remaining seeds. 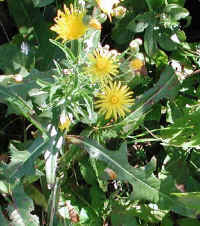 (Sow-Thistle, Common (Sonchus oleraceus) - 05) The common sowthistle has alternate leaves are up to 10" long and 2½" across. The leaves become smaller and more sparsely distributed the higher up the central stem they grow. 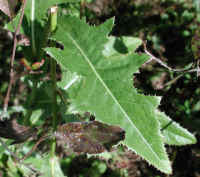 Each leaf has an odd pinnate shape (pinnatifid) with deep triangular lobes; its margins are dentate with soft prickles. 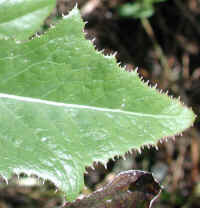 The upper leaves are more likely to be entire or have shallow lobes, as can be seen on this one. (Sow-Thistle, Common (Sonchus oleraceus) - 05a) This is a closer look at the prickles on the margin of the sow-thistle leaves. (Sow-Thistle, Common (Sonchus oleraceus) - 06) The is another look at a sow-thistle leaf. 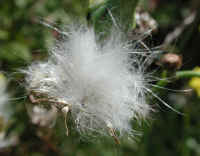 The foliage of the sow-thistle contains a milky latex, which has led to the other common names of common milk sowthistle, milk thistle, and even milkweed which could be confusing when actual milkweed is growing in the same areas, as we have here at Sleepy Hollow Lake. (Sow-Thistle, Common (Sonchus oleraceus) - 07) In this photo we have a better look at the leaves growing from the main stem of the sow-thistle. (Sow-Thistle, Common (Sonchus oleraceus) - 07a) This is a closer look at the leaf axil of the sow-thistle. 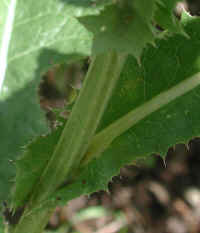 In this photo, we can clearly see that there are no thorns on the stem of the sow-thistle, unlike other thistles. (Sow-Thistle, Common (Sonchus oleraceus) - 08) In this photo, we can see the long stems on the sowthistle flower buds and some of the blooms. 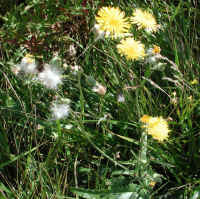 On the internet, we have seen references that state that sowthistle is is native of Asia, and others that say that it is native of Europe, Asia and North Africa. 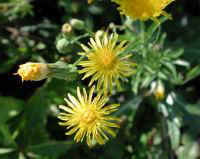 According to the USDA, sow-thistle grow in all 48 contiguous states and Alaska. It is also found in all southern Canada provinces, and up the east coast to Greenland. 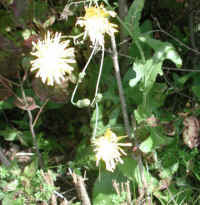 (Sow-Thistle, Common (Sonchus oleraceus) - 09) This is a side view of a sow-thistle's buds and blooms. (Sow-Thistle, Common (Sonchus oleraceus) - 10) This is another look at the blooms and buds of the sowthistle. (Sow-Thistle, Common (Sonchus oleraceus) - 11) This sowthistle is growing just beyond the mowing edge of the berm of the road and leans out over the berm to catch as much sunlight as possible.